ALBANY, NY (WSKG) – There’s a four-way democratic primary for Attorney General of New York, to replace Eric Schneiderman, who resigned over allegations he physically abused women that he dated. One of the candidates, Zephyr Teachout, was at the State Capitol for several events Monday, including an endorsement by Assemblyman Phil Steck. Steck is one of the only state legislators who was a Bernie Sanders delegate to the Democratic National Convention in 2016. They stood in a park outside the building, in a summer down pour. Teachout, a 46 year old Fordham law professor who is in the progressive wing of the Democratic Party, says she joined the race because she believes the country is in a “democratic and constitutional crisis” under the Trump administration, and the state needs a “truly independent” attorney general. “I believe and I know, and I feel it this year, that New York State is really on the verge of major change,” Teachout said. Teachout won 30 percent of democratic primary vote for governor in 2014, when she ran as a virtual unknown against Gov. Andrew Cuomo. She’s also been endorsed by Alexandria Occasio- Cortez, who won a congressional primary in June against Queens incumbent Rep. Joe Crowley. For weeks, Teachout has called for a criminal probe of the Trump Foundation. The current acting Attorney General, Barbara Underwood, filed a civil lawsuit. In recent days, Underwood and Gov. Cuomo, took steps to open two separate criminal investigations. Teachout is taking credit for that. Teachout said she would also like to combat corruption in state government. In recent months several former associates of Gov. Cuomo have been convicted of bribery and bid rigging, and the two former legislative leaders face significant jail time. She said she would restart the Moreland Act commission on corruption, which was begun by Cuomo in 2013, but shut down a year later. She said there was never an executive order formally rescinding the commission, so it could be revived. Later, Teachout appeared at a news conference with women who are survivors of sexual harassment in the state legislature. 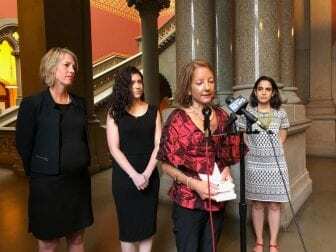 The Sexual Harassment Working Group is calling for public hearings, saying the laws passed earlier this year by Cuomo and the legislature are not adequate in protecting victims and giving them tools to fight back against their abusers. Teachout said if she becomes Attorney General, she wants more powers to pursue sexual harassment cases in state government. The three other Attorney General candidates, including the Democratic Party’s nominee for the post, New York City Public Advocate Tish James, were also invited to appear with the women. But members of the sexual harassment working group say they did not hear back from them. The candidates did not respond to a request for comment. A recent Quinnipiac University poll found James is in the lead, but she has the support of just 26 percent of registered Democrats. Rep. Sean Patrick Maloney has 15 percent, Teachout is at 12 percent, and Leecia Eve is at 3 percent. 42 percent are undecided. Back at the park, Assemblyman Steck is optimistic about Teachout’s chances. He said the Democratic Party is changing and progressives are steering the party back to its roots. Teachout, and candidate Leecia Eve, are calling for a series of debates in the Attorney General primary. But so, far none have been scheduled.